The Snap Environment parameter allows for the vertices of the input features to be snapped to the vertices, edges, and end points of multiple layers or feature classes. When multiple snapping rules are given, they are prioritized as follows: from top to bottom in the tool dialog or from left to right in scripting. The input features' vertices will be snapped to the nearest vertex, edge, or end point within the specified distance. In the Snap Environment parameter, multiple snap rules can be designated using the same layer or feature class with a different type (END | VERTEX | EDGE). If a layer or feature class with a selection is used as the input, only vertices of the selected features will be snapped. When snapping features in one feature class to features in the same feature class, the feature with the lower Object or Feature ID will typically be snapped to the feature with the higher Object ID (OBJECTID field or FID field for shapefiles). For example, if points OBJECTID=1 and OBJECTID=2 are within the snapping distance, the point with OBJECTID=1 will be snapped to the location of the point with OBJECTID=2 (and not vice versa). 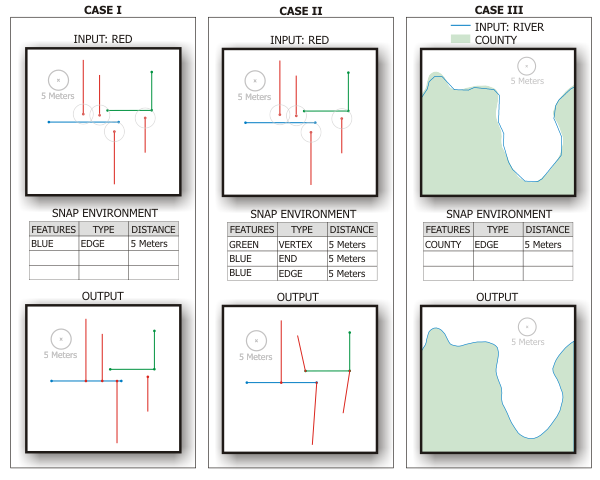 One use case for this tool is to rectify the differences in shared or common boundaries between two datasets by snapping the vertices in one boundary to the vertices, edges, or end points of the other. If the input features do not have enough vertices to match the exact curvature of the other boundary, vertices can be added to the input features using the Densify tool to allow for an added level of detail. The input features whose vertices will be snapped to the vertices, edges, or end points of other features. The input features can be points, multipoints, lines, or polygons. Enter the feature classes or feature layers containing the features you wish to snap to. Features — Features that the input features' vertices will be snapped to. These features can be points, multipoints, lines, or polygons. Type — Type of feature part that the input features' vertices can be snapped to (END | VERTEX | EDGE). Distance — Distance within which the input features' vertices will be snapped to the nearest vertex, edge, or end point. END — Input feature vertices will be snapped to feature ends. VERTEX — Input feature vertices will be snapped to feature vertices. EDGE — Input feature vertices will be snapped to feature edges. In the Snap Environment parameter, if no unit is entered with the Distance (i.e., 10 instead of 10 Meters), the linear or angular unit from the input feature's coordinate system will be used as default. If the input features have a projected coordinate system, its linear unit will be used. The following Python Window script demonstrates how to use the Snap tool.